This week the "The Mouse House" (ABC/Disney) is all about the red and the blue. From news pertaining to studio heads, actors, producers, and writers, find out what sorts of waves Penn alumni are making this week! 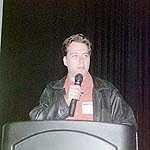 FYI, Rich was a Penn in Pictures panelist back in 2003. Event photos HERE! And tune in this Monday, 10pm when Robert appears on CBS' "CSI:Miami"
ABC gave Josh Goldsmith (C'93) and Cathy Yuspa a pilot commitment for a 30 minute sitcom called "18 Years" about a young married couple adjusting to new their role as parents. 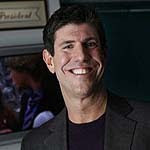 Josh was was the Executive Producer of "The King of Queens", wrote What Women Want and was a Penn in Pictures 2002 panelist. Writer Sherri Cooper Landsman's (C'94) ABC show "Brothers and Sisters" starts up again this Sunday night at 10 pm! ABC/Disney is also behind Todd Lieberman (C'95, Mask and Wig, AEPi), the newly brunetted Liz Banks (C'96) and Max Handelman (C'95, AEPi)'s Surrogates film which comes out today! Let's not forget (like I did) the news I posted earlier this week about Gabriel Mann (C'95, Off the Beat) writing the jingle for ABC's new show "Modern Family".